The upper lip extends from the base of the nose superiorly to the nasolabial folds laterally and to the free edge of the vermilion border inferiorly. The lower lip extends from the superior free vermilion edge superiorly, to the commissures laterally, and to the mandible inferiorly. Around the circumferential vermilion-skin border, a fine line of pale skin accentuates the color difference between the vermilion and normal skin. Along the upper vermilion-skin border, 2 paramedian elevations of the vermilion form the Cupid bow. Two raised vertical columns of tissue form a midline depression called the philtrum. The philtrum is located between the paramedian elevations of the vermilion and the columella above. The labiomental crease passes horizontally in an inverted U-shape across the lower lip, which intraorally corresponds to the depth of the gingivolabial sulcus. The superior labial artery usually branches from the facial artery 1.1 cm lateral (SD 0.43) and 0.9 cm (SD 0.20) superior to the oral commissure. The inferior labial artery branches from the facial artery 2.6 cm (SD 0.70) lateral and 1.5 cm (SD 0.45) inferior to the oral commissure. The facial artery then ascends in the nasolabial groove as the angular artery, forming branches to the nasal ala and anastomosing with the dorsal nasal artery. The facial and labial arteries communicate with the subdermal plexus through a dense population of musculocutaneous perforators. In contrast, the submental artery usually has only 1 main perforator, which penetrates the platysma and ramifies to supply 3-4 areas of the subdermal plexus. 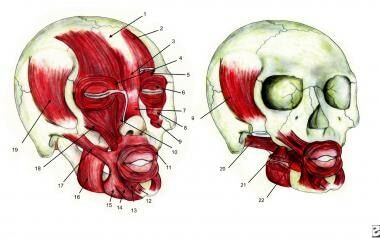 Lips and perioral region anatomy. Lymphatic drainage of the lips. Occasionally, some drainage may be available to the ipsilateral submental lymph nodes. 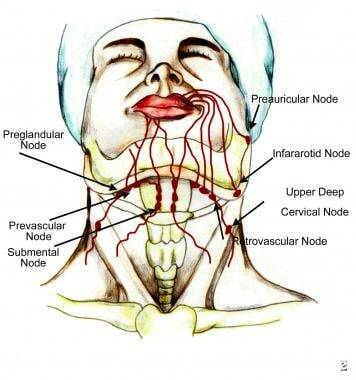 The lower lip lymphatics also coalesce to form 5 primary trunks that lead to bilateral submental nodes from the central lip and unilateral submandibular lymph nodes from the lateral lip. The submental, submandibular, and parotid lymph nodes are the first echelon nodes for the lips. Submental nodes secondarily drain to ipsilateral submandibular nodes, and both submandibular and parotid nodes secondarily drain to ipsilateral jugulodigastric lymph nodes. The motor innervation to the perioral musculature uniformly is from the seventh cranial nerve. The facial nerve has temporal, zygomatic, buccal, marginal mandibular, and cervical branches. The buccal and marginal branches primarily supply innervation to the perioral musculature. Interconnection between the branches is common, with at least 4 connections formed after exiting the parotid gland. The fibers supply the majority of the muscles of the face from their undersurface. The exceptions are the 3 deepest perioral muscles, namely, the buccinator, levator anguli oris, and mentalis. Skandalakis described partial innervation of depressor muscles by an anterior ramus of the cervical branch in addition to the primary marginal branch innervation. Dingman and Grabb reported that in 100 dissections, the mandibular branches were superior to the mandibular border and anterior to the facial artery. In contrast, Nelson and Gingrass found that multiple branches ascending from below the mandibular border provided frequent innervation to the lip depressors. Nelson believed that any branch supplying the lip depressors should be classified as a mandibular branch, as opposed to Skandalakis' classification. The sensory innervation to the perioral region is from the maxillary and mandibular branches of the fifth cranial nerve. The infraorbital nerve, which is a terminal branch of the maxillary nerve, innervates the upper lip. This nerve exits the infraorbital foramen 4-7 mm below the inferior orbital rim on a vertical line that descends from the medial limbus of the iris. The nerve runs beneath the levator labii superioris and superficial to the levator anguli oris to supply the lateral nasal sidewall, ala, columella, medial cheek, and upper lip. The lower lip and chin receive sensory innervation from branches of the mandibular nerve. The inferior alveolar nerve, a branch of the mandibular nerve, forms the nerve to the mylohyoid just proximal to entering the lingula of the mandible. The terminal branches of this nerve inconsistently supply the chin and region immediately lateral to it. The inferior alveolar nerve travels through the body of the mandible to exit from the mental foramen. The mental foramen is located below the apex of the second mandibular bicuspid with 6-10 mm of lateral variability. The mental nerve ramifies to supply the lower lip skin down to the labiomental fold and, occasionally, down the chin as well. The nerve is located in the submucosa as it exits the foramen and frequently is visible in this location. Facial muscles: 1) Galea aponeurotica, 2) Frontalis, 3) Procerus, 4) Depressor supercilii, 5) Corrugator supercilii, 6) Orbicularis oculi, 7) Nasalis, 8) Levator labii superioris, 9) Levator anguli oris, 10) Levator labii superioris alaeque nasi, 11) Orbicularis oris, 12) Mentalis, 13) Depressor labii inferioris, 14) Depressor anguli oris, 15) Platysma, 16) Masseter, 17) Zygomaticus major, 18) Zygomaticus minor, 19) Temporalis, 20) Lateral pterygoid, 21) Medial pterygoid, 22) Buccinator. The orbicularis oris forms a sphincter around the mouth. This muscle purses the lips and presses them against the teeth upon contraction. The superficial portion of the orbicularis oris receives fibers from several other perioral muscles that insert into the orbicularis to provide fine movements of the lips. The deep orbicularis oris is responsible for the sphincteric action of the lips. In cross-section, the orbicularis oris is composed of a long, vertical segment that curls outward at the superior and inferior free margins to form a marginal protrusion. The buccal and marginal mandibular nerves provide motor innervation to the orbicularis oris from its deep surface. In the upper lip, the orbicularis oris fibers decussate in the midline and have dermal insertions approximately 4-5 mm lateral from the midline, sparing the central region. This serves to pull the skin medially at these dermal insertion points, forming the philtral columns. The central region between the philtral columns is devoid of dermal attachments and is pulled into a concave depression. The buccinator arises from the posterior alveolar process of the maxilla, the pterygomandibular raphe, and the body of the mandible and inserts into the modiolus. It functions to press the lips and cheek against the teeth. The buccinator receives motor innervation from the buccal branches of the facial nerve that enter the muscle on its superficial surface. The parotid duct pierces the buccinator after it crosses the anterior edge of the masseter muscle. The levator anguli oris arises from the canine fossa of the maxilla beneath the infraorbital foramen and descends vertically to insert into the modiolus. Its action is to superiorly elevate the commissure. Buccal and zygomatic branches of the facial nerve innervate this muscle. These branches enter the muscle on its superficial surface. The facial artery and infraorbital nerve travel in a plane on the superficial surface of the muscle. The depressor anguli oris arises from the oblique line on the anterior mandible below the canine and premolar teeth. Its fibers pass superiorly and twist medially to insert on the modiolus. The marginal mandibular branch of the facial nerve supplies the depressor anguli oris and enters the muscle on its deep surface. The depressor anguli oris functions to depress and laterally move the commissure. The zygomaticus major arises from the zygomatic bone just anterior to the zygomaticotemporal suture line and passes inferiorly and medially over the buccinator and levator anguli oris to insert on the modiolus. Superiorly, its fibers are deep to the orbicularis oculi muscle. Inferiorly, the fibers are superficial to the facial vessels and facial nerve. The zygomatic and buccal branches of the facial nerve supply the zygomaticus major from its deep surface. Upon contraction, this muscle elevates and laterally moves the commissure. The risorius arises from the parotid fascia and passes medially and anteriorly in a transverse plane to insert on the modiolus. The buccal branch of the facial nerve enters the muscle on its deep surface, providing innervation. Upon contraction, the risorius draws the commissure laterally and produces the sardonic smile. The levator labii superioris arises from the inferior orbital rim on the maxilla, deep to the orbicularis oculi and superior to the infraorbital foramen. Its fibers pass inferiorly to insert into the dermis of the upper lip skin and into the orbicularis oris muscle. Upon contraction, the levator labii superioris elevates the upper lip. The buccal branch of the facial nerve innervates this muscle. The levator labii superioris alaeque nasi arises from the frontal process of the maxilla. Its fibers pass inferiorly to insert on the lateral nasal alar cartilage, the dermis of the upper lip, and the orbicularis oris muscle. The buccal branch of the facial nerve innervates this muscle. Upon contraction, the levator labii superioris alaeque dilates the nostril and elevates the upper lip. The zygomaticus minor arises from the zygoma deep to the orbicularis oculi and just lateral to the zygomaticomaxillary suture. Its fibers pass inferiorly to insert on the upper lip. The buccal branch of the facial nerve innervates this muscle. Upon contraction, the zygomaticus minor elevates and pulls the commissure laterally. Its contraction contributes to the nasolabial fold. The depressor labii inferioris arises from the anterolateral mandible and medial to the insertion of the depressor anguli oris. The depressor labii inferioris lies deep to the depressor anguli oris. The fibers pass superiorly to insert in a fan shape into the lower lip dermis and orbicularis oris. The marginal mandibular branch of the facial nerve innervates this muscle. The depressor labii inferioris acts to depress the lower lip and pull it slightly laterally. The mentalis muscle is a paired central muscle of the lower lip. This muscle arises from the anterior midline mandible and inserts into the dermis of the chin skin. Intraorally, its insertion can be observed at the base of the midline gingivolabial sulcus, which deepens laterally to the centrally positioned muscle belly. Since its muscle fibers pass in an inferior direction, the action of the mentalis upon contraction is to elevate the lower lip. The insertion site of the mentalis fibers into the dermis can be observed in the pout expression. The marginal mandibular nerve innervates the mentalis. The platysma is a paired sheet of muscle in the anterior neck. The muscle arises from the fascia overlying the pectoralis major and deltoid muscles, and it inserts on the inferior border of the anterior mandible. The fibers cross superiorly just before reaching the mandibular border. The platysma is a lip depressor. The cervical branch of the seventh cranial nerve innervates the platysma. Bailey BJ. Head and Neck Surgery-Otolaryngology. 2nd ed. Philadelphia, Pa: Lippincott- Raven; 1998. 1510. Joshi D, Bhatia D. Cross-correlation evaluated muscle co-ordination for speech production. J Med Eng Technol. 2013 Oct 17. [Medline]. Penn JW, James A, Khatib M, Ahmed U, Bella H, Clarke A, et al. Development and validation of a computerized model of smiling: Modeling the percentage movement required for perception of smiling in unilateral facial nerve palsy. J Plast Reconstr Aesthet Surg. 2013 Mar. 66(3):345-51. [Medline]. Rohrich RJ, Pessa JE. The anatomy and clinical implications of perioral submuscular fat. Plast Reconstr Surg. 2009 Jul. 124(1):266-71. [Medline]. Pinar YA, Bilge O, Govsa F. Anatomic study of the blood supply of perioral region. Clin Anat. 2005 Jul. 18(5):330-9. [Medline]. Skandalakis JE, Skandalakis PN, Skandalakis LJ. Surgical Anatomy and Technique: A Pocket Manual. New York, NY: Springer-Verlag. 1995: 21. Dingman RO, Grabb WC. Surgical anatomy of the mandibular ramus of the facial nerve based on the dissection of 100 facial halves. Plast Reconstr Surg. 1962. 29:266-272. Nelson DW, Gingrass RP. Anatomy of the mandibular branches of the facial nerve. Plast Reconstr Surg. 1979 Oct. 64(4):479-82. [Medline]. Alfen NV, Gilhuis HJ, Keijzers JP, Pillen S, Van Dijk JP. Quantitative facial muscle ultrasound: Feasibility and reproducibility. Muscle Nerve. 2013 Sep. 48(3):375-80. [Medline].